Wool rugs are a great investment that can last a lifetime—if you maintain them correctly. Learn how to give your cozy floor coverings a surface cleaning to keep them beautiful and durable for years to come. 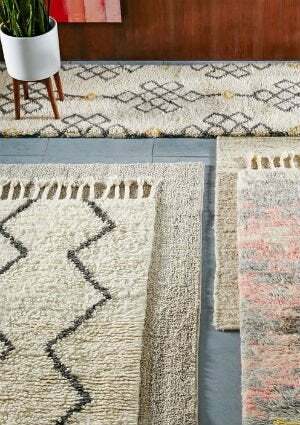 Wool rugs in a home appeal to several senses: Their vibrant colors and patterns improve the look of any space, while their soft fibers offer comfort and warmth beneath bare feet. That said, the most appealing characteristic of wool rugs may be durability—provided they are properly cleaned and cared for. While it’s probably wisest to leave the deep cleaning to the pros, you can remove a lot of harmful grit and grime with a gentle surface scrub about once a year. Ensure that your favorite floor coverings last a lifetime with these tips for washing and maintaining a wool rug. Wool fibers have overlaps and grooves that can trap a lot of dirt—pounds of it, in fact. 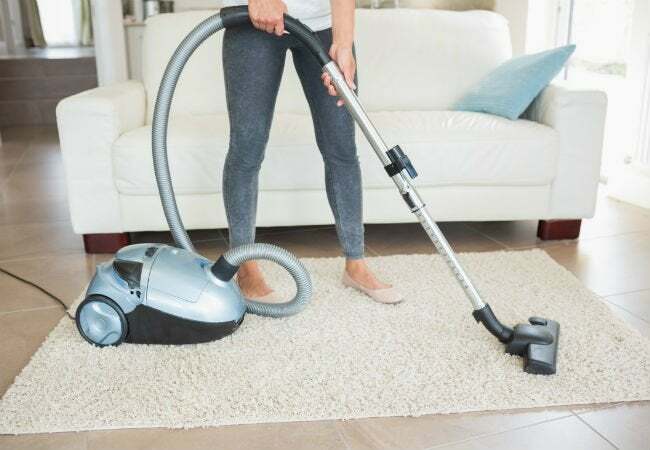 The best first step for getting your rugs truly clean is as old-school as they come: On a nice day, venture outside, hang your rug over a clothesline or deck railing, and whack away with a broom or a proper rug beater (view example on Amazon) until all dirt comes loose. You might be amazed at how much grime flies free. Plus, it’s a great way to relieve tension! Next, take the rug back inside and vacuum the front and back, doing at least three passes on each side to catch any remaining particles that weren’t removed by the beating. Regular vacuuming is crucial for removing dirty buildup from your wool rugs, so don’t forget to perform this classic household chore in between deep cleanings as well. Pour a capful of Woolite (or the recommended amount of a similar product) into a bucket of cold water. Fill another bucket with plain cold water. Before starting work, test a small patch of the rug for colorfastness by applying a little of the cleaning solution to it. If the colors don’t bleed, continue. Starting at one corner, gently sponge your cleaning solution onto a 2’x2′ section of the rug, working in the direction of the nap. You want to lightly dampen the rug—do not soak it or allow it to get too wet; the same wool fibers that enable rugs to hold a lot of dirt also let them hold a lot of water. A wet wool rug will be extremely heavy to handle and will take too long to dry, which can cause it to discolor. After applying your cleaner with a sponge, place a second, clean sponge into the bucket of plain water, and dab the section to rinse, again taking care not to soak the rug. Follow up by blotting the area with dry, absorbent bath towels—you will probably need a lot of them. When you’re finished with the first area, continue working across the rug in small sections until you’ve cleaned the entire rug. Allow your rug to dry thoroughly before walking on it again. If you’re drying it indoors, open the windows and run a fan in the room to speed up the process. Alternatively, take the rug outside and hang it back on the clothesline to dry in the sun. As with anything, prevention beats cure. Take care to keep rugs from getting dirty and stained in the first place by considering a no shoes/no food policy around your treasured floor coverings. With regular maintenance, your fine wool rugs will look great for years—they may even become family heirlooms that will be passed down through generations of family members—if they observe your good cleaning habits, of course. • DON’T try to rub the spot or spill. That will only grind the stain into the rug and cause the fibers to mat together or fuzz. • DO immediately scoop up the solids, and then blot the liquid gently with paper towels, changing them as they become saturated. • DON’T use alkaline detergents like laundry soap, because the buffers that are added to these solutions to keep their pH stable may cause colors in wool rugs to bleed. • DO test a small, less-conspicuous area first, to ensure colorfastness.